A new MIT study finds that Amazon’s system, Rekognition, had much more difficulty in telling the gender of female faces and of darker-skinned faces in photos than similar services from IBM and Microsoft. Over the past two years, Amazon has aggressively marketed its facial-recognition technology to police departments and federal agencies as a service to help law enforcement identify suspects more quickly. It has done so as another tech giant, Microsoft, has called on Congress to regulate the technology, arguing that it is too risky for companies to oversee on their own. Now a new study from researchers at the MIT Media Lab has found that Amazon’s system, Rekognition, had much more difficulty in telling the gender of female faces and of darker-skinned faces in photos than similar services from IBM and Microsoft. The results raise questions about potential bias that could hamper Amazon’s drive to popularize the technology. The companies in last year’s report all reacted by quickly releasing more accurate technology. For the latest study, Buolamwini said, she sent a letter with some preliminary results to Amazon seven months ago. But she said she hadn’t heard back from Amazon, and when she and a co-author retested the company’s product a couple of months later, it had not improved. “It’s not possible to draw a conclusion on the accuracy of facial recognition for any use case — including law enforcement — based on results obtained using facial analysis,” Wood said in a statement. He added that the researchers had not tested the latest version of Rekognition, which was updated in November. With advancements in artificial intelligence, facial technologies — services that can be used to identify people in crowds, analyze their emotions, or detect their age and facial characteristics — are proliferating. As companies begin to market these services more aggressively for uses like policing and vetting job candidates, they have emerged as a lightning rod in the debate about whether and how Congress should regulate powerful emerging technologies. Proponents see facial recognition as an important advance in helping law-enforcement agencies catch criminals and find missing children. Some police departments, and the FBI, have tested Amazon’s product. But civil-liberties experts warn that it can also be used to secretly identify people — potentially chilling Americans’ ability to speak freely or simply go about their business anonymously in public. Over the past year, Amazon has come under intense scrutiny by federal lawmakers, the American Civil Liberties Union, shareholders, employees and academic researchers for marketing Rekognition to law-enforcement agencies. That is partly because, unlike Microsoft, IBM and other tech giants, Amazon has been less willing to publicly discuss concerns. In a letter last month to Gomez, Amazon said Rekognition customers must abide by Amazon’s policies, which require them to comply with civil rights and other laws. But the company said that for privacy reasons it did not audit customers, giving it little insight into how its product is being used. 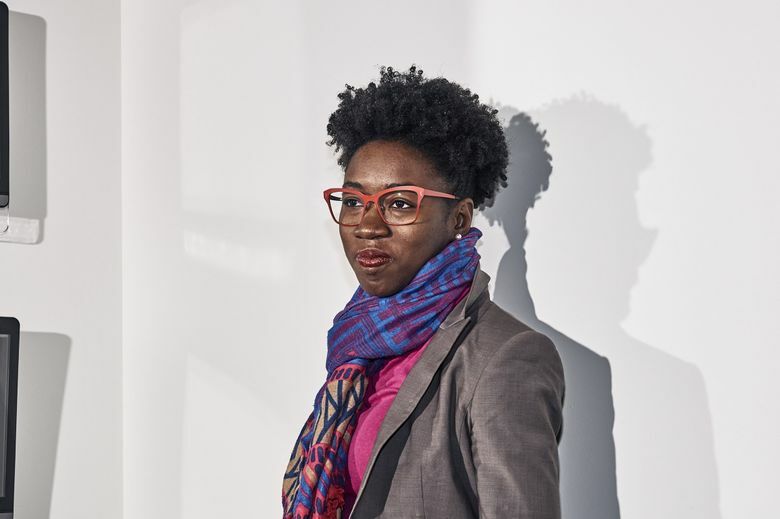 Buolamwini said she had developed her methodology with the idea of harnessing public pressure, and market competition, to push companies to fix biases in their software that could pose serious risks to people. “One of the things we were trying to explore with the paper was how to galvanize action,” Buolamwini said. Immediately after the study came out last year, IBM published a blog post, “Mitigating Bias in AI Models,” citing Buolamwini’s study. In the post, Ruchir Puri, chief architect at IBM Watson, said IBM had been working for months to reduce bias in its facial-recognition system. The company post included test results showing improvements, particularly in classifying the gender of darker-skinned women. Soon after, IBM released a new system that the company said had a tenfold decrease in error rates. Buolamwini wanted to learn whether the study had changed overall industry practices. So she and a colleague, Deborah Raji, a college student who did an internship at the MIT Media Lab last summer, conducted a new study. In it, they retested the facial systems of IBM, Microsoft and Face++. They also tested the facial systems of two companies that were not included in the first study: Amazon and Kairos, a startup in Florida. The new study found that IBM, Microsoft and Face++ improved their accuracy in identifying gender. Melissa Doval, chief executive of Kairos, said the company, inspired by Buolamwini’s work, released a more accurate algorithm in October. Buolamwini said the results of her studies raised fundamental questions for society about whether facial technology should not be used in certain situations, such as job interviews, or in products, like drones or police body cameras.